Travis, D. J., Carleton, A. M. and R. G. Lauritsen. 2002. 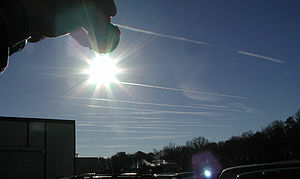 Contrails reduce daily temperature range. Nature 418:601. Astronaut photograph ISS004-E-11807 was provided by the Earth Sciences and Image Analysis Laboratory at Johnson Space Center. Additional images taken by astronauts and cosmonauts can be viewed at the NASA-JSC Gateway to Astronaut Photography of Earth.